Why The Name “Pink Gazelle Productions”? A pink gazelle, on the other hoof, is a positive way for a woman to perceive herself. To be a pink gazelle is to believe in one’s self, creative capabilities and a capacity to contribute significantly to society – in whatever way is authentic for her. Being a pink gazelle means having the courage to pursue one’s dreams with passion, purpose and integrity – and having the patience to go through the process. A pink gazelle has a strong sense of self-worth and has learned, often the hard way, the importance of standing up for what she believes in…because if she doesn’t, who will? There’s more! Picture a row of gazelles standing at one side of the watering hole in the middle of the desert. And on the other side of the watering hole is a row of antelopes. Women are the gazelles; guys are the antelopes. Now if a gazelle knows she’s a pink gazelle, the theory is that her antelope – the blue one – will see her as pink. But to all the other antelopes, she will appear as a plain white gazelle. Likewise with her antelope…only she will see him as blue (and of course he has to see himself as blue, too). So across the watering hole their eyes meet…and then they get to chatting and then dating and perhaps even mating! But then one day, back at the watering hole together, what comes crashing down the sand dune but a big fat water buffalo a.k.a. FEAR! But all is not lost because a water buffalo is not a predator gazelles and antelopes need to worry much about. In fact, the big fella is probably just stopping by the watering hole for a drink – and will move on in short order. 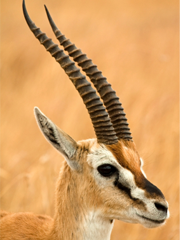 The key, of course, is for the gazelle and antelope (or gazelle & gazelle or antelope & antelope, etc) to just stay where they are and face those fears head on. And that’s why the Pink Gazelle Productions Blog and monthly e-zine is called The Watering Hole!